Police have fired water cannons and used tear gas to disperse several thousand demonstrators in the Turkish town of Soma, which became the scene of the country’s worst mining disaster earlier this week. People scattered into side streets as the police were dispatched onto one of Soma's main commercial thoroughfares, where the offices of the local government and labor union are situated, an eyewitness told Reuters. According to Evrensel.net, a journalist, who was covering the rally, received injuries as a result of the police attack. 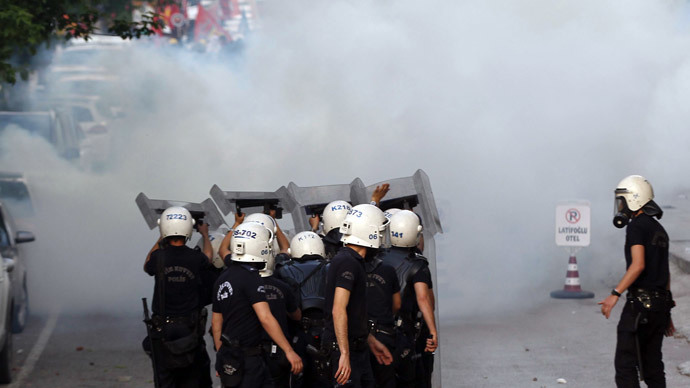 The police also used plastic bullets, and arrests were made among Soma's rally participants. The protesters told the website that they wanted to gather to honor those who died in the mine with a minute of silence. However, the police forbade the action, saying that force would be used if people remained on the street. 292 miners lost the lives in Soma on Tuesday, with the reasons for the disaster currently under investigation by the country’s authorities. The tragedy led to riots all across Turkey, with protesters blaming the owners, who took charge of the mine after privatization, of neglecting the lives of their employees to reduce costs. There were protests in Soma on Thursday and Wednesday, with police using force to disperse them on both occasions.